Joanne Harris’ Chocolat is a book about alchemy of sin, about life’s temptations, about choices that make us what we are. Chocolat is also the book Bhags and I have picked as book of the month for our brand new book club "This Book makes me Cook". When Bhags ran her event with the same name last month, I told her I enjoyed getting inspiration for my cooking from fiction and will continue posting recipes inspired from books. She then suggested that we do it together. And so the idea was born. We are going to pick a book every month, read it and tell you about the book and the recipe our reading inspired. First the book : The vividly colorful story of a gypsy mother and daughter who make their home in a sleepy french village. The relationships they form, their friends, their rivals, the memories that come back to haunt them - all of these come alive in Harris' telling. Tucked away in a small corner of Malad's Evershine Nagar is an Unrestaurant called Pop Tates. What first draws attention to the place is its unconventional menu based on Archies characters and the chirpy quips on the placemats. What takes you back several times is the excellent food or rather the excellent sizzlers. Sizzlers are what almost everyone orders there. It is very easy for me to picture those sizzlers. Not because I've had them many times (I've had!). But because irrespective of which one you order, they are basically all the same. On one side of the sizzling plate is a mound of rice. In the middle, the vegetable or meat you ordered. The other corner of the sizzler plate is split between boiled veggies and fries. Tucked somewhere in this melange are sautéed button onions, a stuffed capsicum and sweet corn in white sauce. There's uniformity here, but there's also attention to detail. Chinese food is probably the most common take-out, order in, eat out food in India. Call it indo-Chinese, Punjabi-Chinese or (my favorite term) dhaba Chinese – it is fusion food at its best. The dhaba Chinese that I grew up on had vegetarian chowmein and some sort of Manchurian as its central dishes. Chowmein is, of course, some noodles with vegetables. And its spicy - very Indianized spicy. Manchurian is a story in itself. You will never find Manchurian in any Chinese menu outside India, for the obvious reason that it’s an Indian invention. Legend has it that a Chinese chef, who lived in India all his life, wanted to pep up the menu of his newly opened restaurant in Bombay with something customized to Indian palate. So he combined two Indian favorites – deep fried and spicy food to create something that’s symbolized Chinese food to generations of Indians ever since. Its essentially some batter fried vegetable/meat (close to but not exactly a ‘pakora’) dunked in a basic spicy sauce. Dhokla is an all time favorite. But I can never get it to look or taste like this. This dhokla comes my way every couple of weeks our guest chef makes it. You will notice this is less like the traditional dhokla, and probably closer to the idli/dosa batters but our guest chef says this is guaranteed to dish out perfect, fluffy dhoklas every time. Grind 1/2 cup urad dal and 1 1/2 cups rice to a powder. Mix with 1 cup yogurt - you might need more or less, just make sure you have a runny batter. Leave overnight to ferment. In the morning, grind 1 tbsp corinader, 1/2 tsp ginger, 2 cloves garlic and 2 green chillies to a paste. Add this paste, 1/2 tsp turmeric powder and salt to the batter. Mix well. Finally, add 1 tsp Eno and steam in a dhokla maker for 20 minutes. Let it cool slightly and cut into squares. For the tempering, heat 1 tbsp oil. Add mustard seeds (rai) and curry leaves, saute for a few seconds, then pour over the dhokla squares. Garnish with coriander. 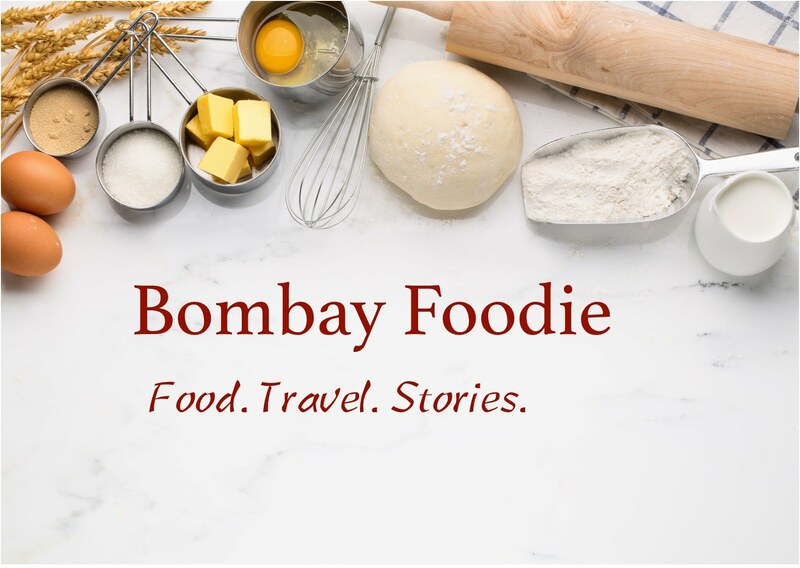 We are celebrating Bombay Foodie's 50th post with a dinner at Prithvi Cafe. Placed in the courtyard of Prithvi Theatre, this is not just another eatery. Prithvi cafe is an institution, serving its famous non-alcoholic Irish Coffee for eons. Every evening, the outdoor stone tables see a colorful variety of people. Well dressed yuppies, struggling artists, an occassional star : this is a place to sit, relax and gawk. Even the indifferent and callous service is a part of the setting. The food at Prithvi cafe was never something to write home about. Not until last year. Then Prithvi went for a makeover. And what a change! Instead of coming up with their own menu, Prithvi Cafe went to look for the best street food of Bombay. The new menu at Prithvi is a journey through Bombay's culinary history, an ode to everything and everyone that makes Bombay food what it is today. I so love Nicole's Taste & Create. Every month, she pairs me with another blog so I can get to know someone very well. All she asks in return is that I create something from my partner's blog. My partner this month is Shaw Girl, a southern belle now living in Washington DC. As coindence has it, both of us started blogging in February. And she's already a daring baker. Where do you get the courage, girl! Adventures in Shaw has lots of easy, healthy recipes - just the kind I dig so I did not have to look far. In fact, I decided to make the first recipe I saw on the blog : Mama's Mayonnaise Biscuits. Shaw Girl has adapted this super-quick and delicious recipe from her currently favorite cookbook “Bon Appetit, Y’all”. When Srivalli announced her Roti Mela, I was at a loss to find a special roti to send her way. While my friends think of aloo paranthas and mooli paranthas as special meals, I grew up thinking them commonplace breakfasts in Punjab. So I had to think what my mom will call special. For she does have those occasional treats, some things so sinful that she will only make them every once in a while. The obvious answer was chana dal parantha. To make the parantha, boil 1/2 cup split yellow lentils until al dente. In a bowl, mix the lentils, one small onion chopped finely, a tbsp of chopped coriander, salt, garam masala, red chilli powder, cumin seeds and anardana (dried pomegranate seeds). Mix well to make your filling. Knead one cup whole wheat flour with enough water to make a firm yet pliable dough. Let it rest for a while. Or a cherry. Or a litchi. Usually, by the time June rolls in, I've had my fill of mangoes and melons and am eagerly awaiting winter pears and lush oranges. But not this year. For the past three weeks, I've been spoilt silly by the sheer mindboggling variety of fruits available in the markets. All of them my favorites. A single trip yesterday yielded bunches of perfectly sweet litchis, bright red cherries rarely seen in Bombay and fresh just-ripe apricots. If I'd wanted any more fruits, they had lovely peaches and plums. Bags full of green almonds have been around for more than a month now. As my pal Bertie Wooster will say, this has been a rum summer for fruits. For once, I'm not complaining. “We used to hang out at Mondy’s every Friday”; “It’s the place we had most fun during college”; “You simply must go there once” – it seems like everyone in Bombay has a fond recollection of Café Mondegar. Intrigued, I followed my friend’s directions and walked down from Regal towards Colaba Causeway. At first, I saw this signboard hanging over a corner jewellery shack. A closer scrutiny revealed a door to an ancient looking café. When I first came to Bombay, I thought Ragda Patties (aka pattice) are just another name for aloo tikki. A couple of tastes later, I knew these two were not even from the same planet. If you are ever confused like me, here's a guide to ragda patties for dummies. Aloo Tikki: A flat potato cutlet shallow fried on a griddle. Served topped with green mint chutney, sweet tamarind chutney, yogurt and onions. Occasionally, a chickpea curry is served alongside the aloo tikkis instead of these toppings. 1. The potatoes in the aloo tikkis are white and bland. The ragda patties potatoes are a spicy yellow (they always add turmeric to fried potatoes in Bombay, even in batata vada). 3. Ragda patties come topped with a curry made from dried yellow peas (also called vatana) and with the chutneys. Its a heady combination. There's something awfully nice about making oaties. You get that wonderful "Its really healthy; I'm doing my heart a favour" feeling. All while eating copious amounts of butter and sugar. And oaties combined with chocolate...let's just stop talking and start eating. Cream 50 gms butter with 50 gms raw sugar. Add 1 tbsp lukewarm milk and 1/2 tsp vanilla essense. Beat until everything is well blended. Separately, mix 70 gms flour, 1/2 tbsp cocoa powder and a pinch of baking powder. Add the flour to the butter/sugar alongwith 50 gms oats. Mix well to make a smooth dough. Now add in 50 gms chocolate chips. My dough was quite runny (probably due to Bombay heat), so I left it in the fridge for 10-15 minutes. While the dough is resting, set oven to preheat at 180C. Make balls of dough and plonk on the baking sheet. Press to flatten and bake for 15 minutes. Eat.